Asset allocation refers to an investment strategy in which individuals divide their investment portfolios between different diverse assets classes to minimize investment risks. The assets classesAsset ClassAn asset class is a group of similar investments. Different classes of investment assets – such as fixed income investments - are grouped together based on having a similar financial structure, and because they are typically traded in the same financial markets and subject to the same rules and regulations. fall into three broad categories: equitiesStockWhat is a stock? An individual who owns stock in a company is called a shareholder and is eligible to claim part of the company’s residual assets and earnings (should the company ever be dissolved). The terms "stock", "shares", and "equity" are used interchangeably., fixed-incomeTrading & InvestingCFI's trading & investing guides are designed as self-study resources to learn to trade at your own pace. Browse hundreds of articles on trading, investing and important topics for financial analysts to know. Learn about assets classes, bond pricing, risk and return, stocks and stock markets, ETFs, momentum, technical, and cash and equivalentsCash EquivalentsCash and cash equivalents are the most liquid of all assets on the balance sheet. Cash equivalents include money market securities, Bankers Acceptances, Treasury bills, commercial paper, and other money market instruments.. Anything outside these three categories (i.e. real estate, commodities, art) is often referred to as alternative assets. Goals factors are individual aspirations to achieve a given level of return or saving for a particular reason or desire. Therefore, different goals affect how a person invest and risk. Risk tolerance refers to how much an individual is willing and able to lose a given amount of the original investment in anticipation of getting a higher return in the future. For example, risk-averse investors withhold their portfolio in favor of more secure assets. On the contrary, more aggressive investors risk most of their investments in anticipation of higher returns. Learn more about risk and returnRisk and ReturnIn investing, risk and return are highly correlated. Increased potential returns on investment usually go hand-in-hand with increased risk. Different types of risks include project-specific risk, industry-specific risk, competitive risk, international risk, and market risk..
Time horizon factor depends on the duration an investor is going to invest. Most of the time, it depends on the goal of the investment. Similarly, different time horizons entail different risk tolerance. For example, a long-time investment strategy may prompt an investor to invest in a more volatile or higher risk portfolio since the dynamics of the economy are uncertain and may change in favor of the investor. However, investors with short-term goals may not invest in riskier portfolios. Financial advisors usually advise that to reduce the level of volatility of portfolios, investors must diversify their investment into various asset classes. Such basic reasoning is what makes asset allocation popular in portfolio management because different asset classes will always provide different returns. Thus, investors will still receive a shield to guard against the deterioration of their investments. The distribution of his investment across the three broad categories, therefore, may look like this: $5,000/$4,000/$1,000. In asset allocation, there is no fixed rule on how an investor may invest and each financial advisor follows a different approach. The following are the top two strategies used to influence investment decisions. In age-based asset allocation, the investment decision is based on the age of the investors. Therefore, most financial advisors advise investors to make the stock investment decision based on a deduction of their age from a base value of a 100. The figure depends on the life expectancy of the investor. The higher the life expectancy, the higher the portion. That’s why the base value may change to 110, or 120. For cash and money market investments, most advisors recommend that the time horizon should be less than a year. Using the previous example, let’s assume that Joe is now at 50 years and he is looking forward to retiring at 60. According to the age-based investment approach, his advisor may advise him to invest in stocks in a proportion of 50% then the rest in other assets. This is because when you subtract his age (50) from a hundred-base value, you’ll get 50. In life-cycle funds allocation or targeted-date, investors maximize their returns on investmentReturn on Investment (ROI)Return on Investment (ROI) is a performance measure used to evaluate the returns of an investment or to compare efficiency between different investments. ROI measures the return of an investment relative to the cost of the investment. (ROI) based on the factors like their investment goals, their risk tolerance, and their age. 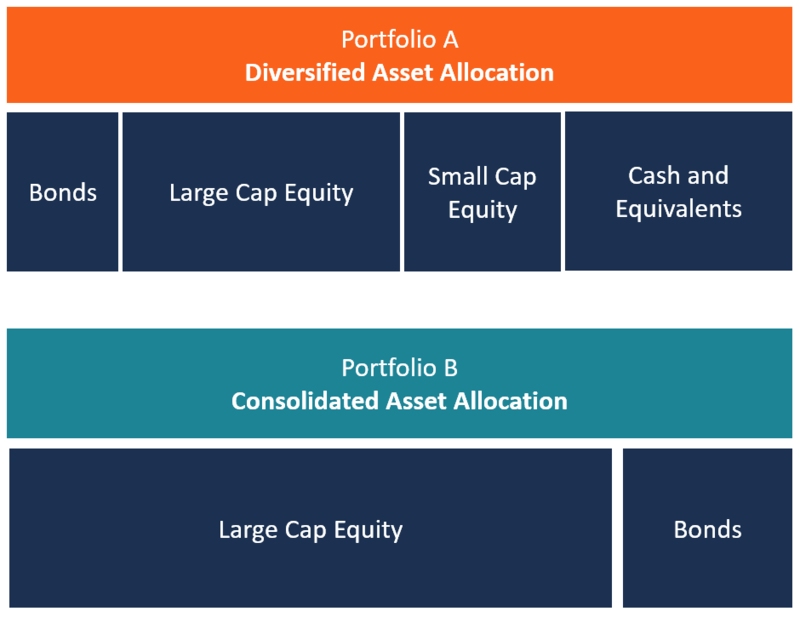 This kind of portfolio structure is complex due to standardizations issues. In fact, every investor has unique differences across the three factors. Let’s say Joe’s original investment mix is 50/50. After a time horizon of five years, his risk tolerance against stock may increase to 15%. As a result, he may sell his 15% of bonds and re-invest the portion in stocks. His new mix will be 65/35. This ratio may continue to change over time based on the three factors: investment goals, risk tolerance, and age. The constant-weight asset allocation strategy is based on the buy-and-hold policy. That is, if a stock loses value, investors buy more of it. However, if it increases in price, they sell a bigger proportion. The goal is to ensure the proportions never deviates by more than 5% of the original mix. The tactical asset allocation strategy addresses the challenges that result from strategic asset allocation relating to the long run investment policies. Therefore, tactical asset allocation aims at maximizing short-term investment strategies. As a result, it adds more flexibility in coping with the market dynamics so that the investors invest in higher returning assets. For investors prone to risk, the insured asset allocation is the ideal strategy to adopt. It involves setting a base asset value from which the portfolio should not drop from. If it drops, the investor takes the necessary action to avert the risk. Otherwise, as far as they can get a value slightly higher than the base asset value, they can comfortably buy, hold, or even sell. The dynamic asset allocation is the most popular type of investment strategy among the rest. It enables investors to adjust their investment proportion based on the highs and lows of the market and the gains and losses in the economy. Guide to Portfolio Management ProcessPortfolio ManagerPortfolio managers manage investment portfolios using a six-step portfolio management process. Learn exactly what does a portfolio manager do in this guide. Portfolio managers are professionals who manage investment portfolios, with the goal of achieving their clients’ investment objectives.